The first Good Beer Guide post-Roger* is with us, and a thing of beauty it remains. Until it’s been battered by being dropped, splattered in Chinese takeaway, and generally mistreated so the pages start falling out somewhere in Ilkeston. Before I start, thanks to all the CAMRA volunteers who do the dirty and unheralded work to get this thing out. I appreciate it. You can read a lot of complaints about selections/favouritism/irrelevance of the Guide, but it gets it right 95% of the time. HURRAH FOR BEER QUALITY ! Although you clearly enjoy reading about me occasionally tipping beer down the urinal, I can assure you that’s a rarity. And that pub has left the Guide this year, along with a fair few others I took against on these pages. In contrast, sixteen pubs visited in GBG19 so far, only one duffer, and beer good to great in all the others, from Brandon to Bloomsbury to Sawbridgeworth. 4524 pubs in the GBG, at least 350 entering the Guide for the first time. Only an authority like Pubmeister could tell you exactly how many were new as opposed to rebranded or renamed or just revived, and his parchments are still being reviewed in the specially built Beer Guide Archives in an underground bunker near Paisley. My own fevered analysis shows the new entries to the Guide includes 103 micro pubs, 56 brewery taps and craft bars, 13 clubs and 18 chain pubs (Spoons, B&K etc). You can argue about the dividing line between some of those, but the point is that half the new entries aren’t micros or modern bars. Hurrah for that. FOLK WHO LOVE MICRO PUBS. ALL the half-dozen new entries in Merseyside are small new pubs or similar. More places to meet your CAMRA mates. THE AUTOVAC. Hurrah for beer with taste ! No joke. BORING BROWN BITTER. Plenty of beers you’ve heard of in the new entries. My early season ticking includes a pub selling just Doom Bar. JUST DOOM BAR. And it was the beer of the month so far. BREWERIES. The press release for the GBG leads on the number of breweries, 2,500 of them, most of them struggling to get space on the bar (see here). BLACKBURN. Blackburn gets its first town centre GBG entry for years, giving me another reason to visit their marvellous cathedral and museum. MILTON KEYNES. A sudden clutter of entries around the historic centre, not one of them visited by my on my two recent visits without the Guide. HALIFAX. Britain’s best pub town (and I can’t believe I’m writing that) gets another 3 new entries, and surely deserves a doubling of its allocation. WHEELBARROW MANUFACTURERS. With over 1,000 pages, 300 of them the brewery section, tickers needs assistance to transport the brick round the micropubs. THE COOPERS TAVERN. About time too. Best pub next to a curry house in the UK. THE SUN, WATERBEACH. As above. A classic local. OPENING HOURS. On the same theme, there’s some places with absurdly tight opening hours again this year. 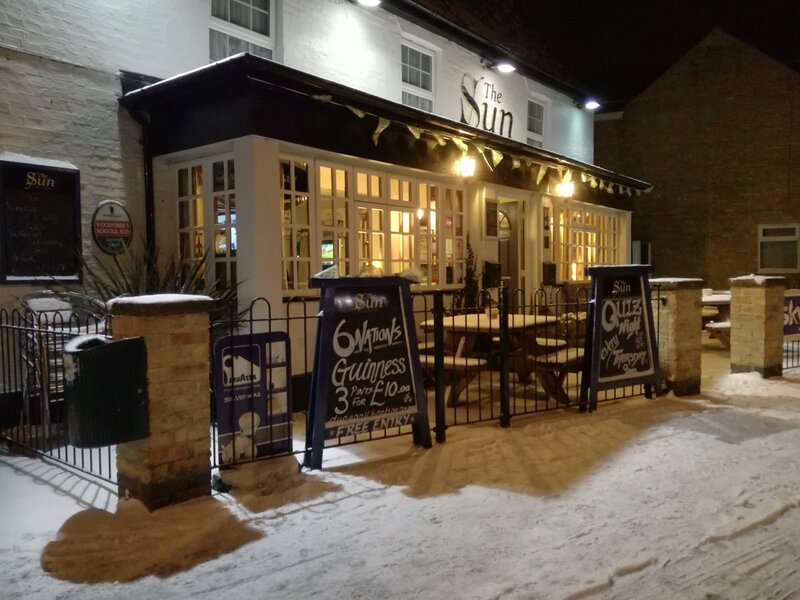 Take the Cricket Club in Empingham, Rutland; Wed – 8pm-11pm, Fri 8.30pm-midnight, Sun 1pm-3pm. Good luck, BRAPA. GEOGRAPHICAL CONSISTENCY. Pubs shown under their city one year, their suburb the next, then the nearest village. You know who you are, Chesterfield. BUCKINGHAM. No pubs in the county town, or anywhere on the A421 beer desert. SNAITH. The jewel in the East Yorkshire crown (Source: A Snaith resident) apparently has it’s new Beer Guide pub in evil North Yorkshire (see P.546). Anyway, chop the brewery section out next year and I’ll have no complaints. I suppose I could always follow BRAPA’s example and use the Stanley knife. Less carping, more ticking. Nothing beats a pint (note: a pint) in a good GBG pub. And, for some, a fag outside. *There’s no obvious straight replacement as Editor; clearly it seems to take a team of millions to replace the great Mr Protz. Yes, I was surprised to see no credit for any editor. If they are reading this, for the right fee, I will happily do it. Mind you I’d do it for free if I could delete any pub selling solely Doom Bar. Thanks for clarification. Always like to see editor(s) name on front though. “There’s no obvious straight replacement as Editor; clearly it seems to take a team of millions to replace the great Mr Protz” is a bit over the top in that the Editor had NO say in which pubs were and weren’t in the book. His role was to write some of the first thirty pages and I’m sure that such a well known name on the front cover boosted sales to some extent. “This conference acknowledges that CAMRA’s flagship publication is the Good Beer Guide not the Interesting Beer Guide, notes with concern that the guide is less useful now that some ‘pubs’ with very limited opening hours are included and instructs branches not to include in future editions those venues that are open for an average of less than thirty hours a week” – Proposed by Martin Taylor, Cambridge. Seconded by whoever. That’ll make for an interesting twenty minutes in Dundee next April ! I’d second that motion! Also places that don’t serve pints. Hmmm. Take a look at the 1999 edition and then the millennium one and tell me that all Roger did was contribute to the glossy pages ! Both 578 pages and both 5000 pubs I didn’t notice much difference between the two books nearly twenty years ago and, glancing at them again, don’t now – so what am I missing ? I’ll tell you on Wednesday. I’m confused (not a new phenomenon) as to why you and others (e.g. Mudgie, BRAPA) are so against the brewery section of what is supposed to be a good beer guide and not a good pub guide. It strikes me as vital and important information for such a book – or am I missing something?. It adds unnecessary bulk and weight to the publication (about 30% of the total pagination) and, given the huge proliferation of breweries and beers, is of very little practical use when actually visiting pubs. It should be hived off to a separate publication of “The CAMRA Guide to British Real Ale Breweries”. I’d guess that over half the breweries do not have a single beer listed as a permanent brew in a GBG entry. That answered Pete for me. A sensible question, though. 20 years ago it served as a guide and set of tasting notes to a few hundred commonly available beers you’d find on your pub travels. Now it’s a guide to all the many thousands of beers you’ll never see in pubs but might encounter at beer festivals. well in the 2006 guide it took up about 150 pages, in 2019 guide its now taking up about 300ish which is nearly 1/3rd size of the whole book. So its adding alot of extra bulk/weight and theres no “Good” criteria being applied to them, its just a list of breweries at the time the book is published and given the perilous state of the industry these days its even harder to keep track of than pubs openings/closings, not helped as well I think that theyve included lots of breweries that have long since been consumed by larger brewers. I mean is there really any value in an entry for Tolly Cobbold that just says “see Greene King” in 2019 when theyve in effect not existed as a stand alone brewery since 2002.
plus Ive seen lots of the micro brewers in the past weeks thank Camra for their inclusion as it shows theyve been recognised for making good beer…so its also losing the understanding of what that info is there for, and I think Camra should just split it out into a seperate book if necessary if people want that information, I never even in the days before you could just look the stuff up online referred much to it. It confuses pub beer quality (selective entry) and brewery (just a listing). The clear implication in the article is that pub itself has been selected on quality grounds. Of course, it doesn’t help when the press release for the GBG leads on the number of breweries. Yes, please don’t forget to tell me on Wednesday. “Unnecessary bulk and weight ….. of very little practical use when actually visiting pubs” and the breweries “just a listing” not being a “selective entry” are both important points. Also the press release mentions “the number of UK breweries rise to 2,500 — 1,750 of which produce real ale” so is there really now space given to 750 breweries that produce NO real ale ? Personally I always liked the brewery bit, though the last edition I owned was the 2010, now have the app, however in an alcoholic haze Friday night , I have managed , in a pique of nostalgia, to order the new one via Amazon. I won’t be lugging it about with me, I can always colour it in when I get home. Colouring it in is the true mark of a #PubMan, Citra. I guess the problem is that the problem with your pint of real ale is hardly ever down to the brewery, in my ill-informed opinion. Even Greene King IPA and (I discover) Doom Bar can be tasty, let alone the derided Pedi/Bass/Banks’s/6X. Autovac providing taste??? Just think how great the beer would be if it weren’t recycled. Proof is in the tasting, and Staggs is the Scottish pub of the Year ! A masterful post that prompted lots of those interesting comments and a bout of introspection here. It might be because I won’t be able to get properly started for ages but this is the first time I am seriously thinking of not completing (or at least trying to complete). Not just the silly opening times but also something you said when we last met that once completed you would probably be inclined to move on to something else. I thought that too but just carried on. Is this the year?! But then who’s going to drive me to Guernsey ! Do all the Brewhouse & Kitchens in the same year, Duncan. Kill or cure. Yes definitely as it was the Bollin Fee before. One for you- is King St Tavern in Southsea same as King’s that has been in a few years ago? Kings St Tavern (Wadworth) def different from King’s Hotel (which I’ve never been to),unfortunately. And KST used to be Diamond so almost certainly a different pub. Thanks. Got up to ‘K’ ticking. Kent’s new batch of micros challenging especially Boughton Winchelsea (closed Mon-Thurs). Managed 2 anticipatory micros Folkestone & W Malling otherwise identical needs to you. Very proud the Sun is back. It scores highly with locals but it doesn’t get a lot of visitors because it stocks beers you’ve heard of !